Real Estate: Why does the maximum compound gain happen somewhere in the middle of the mortgage term? 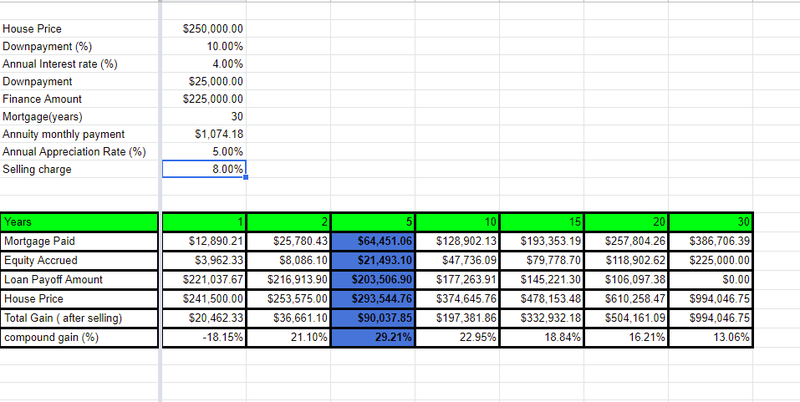 I construct a spreadsheet to investigate when is the best time to pay off a house loan. and I assume that the rental income collected is exactly the same as the annuity monthly payment and used to offset it, to avoid complications in terms of compounding interest charge on the mortgage loan. Assuming 30 years mortgage, when is the best time to pay of the house loan given the above information? Given that the house is appreciating faster than the interest rate ( 5% vs. 4%), and given that in the beginning of the mortgage, most of the payment goes to the interest ( very little equity accrued), I would expect that the longer into the mortgage years, the higher the compound gain ( in % terms). So the maximum compound gain should occur at the end of mortgage loan, in this case it is 30 years. But this is not what I found; instead, I found that the maximum compound gain occurs at somewhere between around year 5. Playing around with the interest rate, downpayment, appreciation rate and other variables confirms one thing, that maximum compound gain will not always occur when the mortgage matures at 30 years. Instead, it's occurring somewhere in the middle, from year 5 to year 20 quite frequently. It seems that there is a time to settle the full house loan, and it's not at the end of mortgage term, despite that the house appreciates faster than interest rates on the loan. I've no idea why this is so, any explanation? Some object that the appreciation rate is higher than inflation/mortgage loan rate, but this is besides the point. If anything, higher appreciation rate should mean that the the maximum compound gain should happen at the end of mortgage. But it's not, and this is why I'm asking the question. Even if you set the appreciation rate to be the same as mortgage loan rate, the same conclusion still applies in some situation, eg: selling charge=0%, and annual interest=annual appreciation=4%. Even when the rent is inflation-adjusted, and the management fees and gain tax is included, the same behavior persists. Another bug regarding the mortgage payment is deducted from final gain is fixed ( it shouldn't, as it's the tenant who pays for the mortgage payment in this contrived example). After fixing, the my results and the answer here results are now the same. But still, the behavior persists. What you are not considering here is the financial leveraging of the equity-based gain. Leveraging refers to the fact that using loaned money to invest, increases the punch of your equity dollars. As long as your earnings are higher than the interest you pay on the loan, you end up with a higher rate of return. Assume I pay $100k for a house, in cash, and then next year I sell it for $105k. In this case, I gain $5k (5%). Now assume I pay $200k for a larger house, with $100k of my own cash, and $100k loaned from the bank at 4% interest, and then next year I sell it for $210k after paying the bank $4k in interest. In this case, I take my $206k after-interest proceeds, and repay the bank their $100k, leaving me with $106k. Considering that I used $100k of my own cash, my gain of $6k is 6% - which is a higher % gain than in the first option, even though in both cases, the house increased in value by the same appreciation rate of 5%. The reason you are seeing the pattern shown in your example, is that as time goes on, your equity increases, and therefore the impact of leveraging decreases. I haven't gone through your numbers in detail to check your math, but it seems relatively reasonable. Consider that your return shown in year 3 of 15% is higher than the appreciation rate on the house, which is 8%. If you had 0 debt, your return would track closely down to this 8% figure. As you approach 0 debt, this is the effect you see. There may be some other things going on with your other factors, but that would be the main one. Now you may be asking: [this is not a hypothetical; in the comments, you did ask] "How can this be because of equity? I don't have an equity calculation in my spreadsheet"
Well really, you do have 'equity' in your spreadsheet. Equity is calculated in your spreadsheet as proceeds - final mortgage payment = net proceeds = equity. As well, let me point out the 'other side' of leverage: risk. As your debt goes up, your return on 'equity' goes up, but your risk also goes up. The higher the debt, the more you absolutely need your rental income to cover your mortgage payments, and the greater the chance that a market downturn will leave you needing to sell the house and still pay up additional cash after proceeds to clear out your mortgage. As Joe Taxpayer points out below, the optimism in your spreadsheet [that the value of the property will increase 5% / year without fail] must be removed for you to make a reasonable decision. If you change that 5% to 4%, how long do you need to own the house before it can be sold for no net loss? If you change it to 2.5%, how long? That type of scenario analysis will show you the difference between an optimistic and a pessimistic scenario. You should be considering both. This is the same as your result, so I understand your calculation. The maximum return is just after year 17. However, I don't see why gain = value - balance - paid. You are investing the downpayment of 25000, then the investment ticks along without further investment because the tenant pays the mortgage. At any point during the term of the mortgage, if you were to sell, the tenant leaves and you have the remaining balance on the mortgage and the value of the property, so the net asset value nav = value - balance. The maximum annualised return occurs just before year 4. The best annualised return from this investment occurs around year 4, at 30%. If you could switch to another investment at year 4 that returned 30% or more that would make sense. 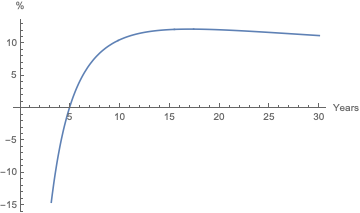 The compounded 30% curve shows that the actual investment returns curve is less steep and cannot keep track to sustain this 30% annualised return. As to why the annualised returns curve has its shape, note that if the selling cost is set to zero then the returns curve starts at zero too, and according to the resulting annualised returns curve you should sell as soon as possible. E.g. with cost set to zero, selling in year 1 obtains a return (also annualised) of 65%. It it the selling cost that pulls the returns negative at the start, and which gives the annualised returns curve its ascending peak at the beginning. The returns curve in the figure above starts at zero and the annualised returns curve has no ascending portion. It seems odd that you refer to the annualised return as 'compound gain' whereas I would refer to the return as the compounded quantity, and the annualised return as the normalised quantity (i.e. not compounded). I don't know if that is a source of confusion. I will continue with both nomenclatures. Consider how you are calculating your return and compound gain (annualised return), say for year 5 (the red dots). You will see that this 20 year return, 1916.64%, is higher than the 20 year compounded return from the estate, at 165.33% (the left purple dot). Annualising both results produces 16.21% versus 5%. The extra return in the investment over the basic appreciation is due to your gaining ownership of the property itself, from the rent from the tenant. In time, the annualised return approaches the appreciation figure. I extended the time axis to 120 years to show this. Note: The part about the incorrect formula being used for house price has been fixed and that part of the answer has been moved to the end. Total gain = House Price - mortgage payoff amount - mortgage paid. which for year 1 is $7,572.12; Then for your two you calculate it as $10,880.67. Your math is correct but your logic isn't clear. I assume that the rental income collected is exactly the same as the annuity monthly payment and used to offset it, to avoid complications in terms of compounding interest charge on the mortgage loan. You are ignoring depreciation while you are renting it out, you are ignoring taxes, and your are ignoring recapture; yet you include the amount of the monthly payments. You are also ignoring mortgage insurance, and the typical lender requirement of 20% down. I would just subtract payoff amount from house price. So after a year you would have 20,462.33 in cash returned to you, which you spent 25K via your down payment. So there is a loss. If you keep your formulas then you must of ~1.96% annual appreciation to have positive compound growth by year 30. As you increase the annual appreciation the time to get to positive compound growth grows shorter. This part discusses a formula which has been corrected. The equation for house price is wrong. It should be 253,575. you dropped the 8% selling charge. Another way to calculate it is 1.05 times the year 1 number which also gives you 253,575. TL:DR The behavior is an artifact of the OP ignoring the fact that rent pays the mortgage. When the math is done correctly, it goes away once the cost of sales (8%) is covered. I am viewing the spreadsheet and made a copy so I can edit it. For trouble shooting purposes, I set the selling fee and appreciation equal to zero. Given your scenario where we ignore any other costs, and assume the rent covers them and the mortgage, you have invested $25K, and 30 years hence, have a paid off property, worth $250K. Your spreadsheet shows a loss of $137K, i.e. all the interest for 30 years. This scenario, however unlikely, returned 10X your investment, or 7.98%/yr. When I adjust profit to show as the return on your initial $25K, and crank the appreciation to 5%, the results are more accurate. A higher % return in year one, and a steady drop from there. Last, and final. Putting the 8% cost of sale back in, the return peaks in year 3, as part of year 2 growth is still needed to offset that cost. For the above, note, I am not debating the numbers, per se, only trying understand the choice of considering the principal paid by the tenant as a cost. In the end, your conclusion of some peak return is based on a false premise, you are ignoring the fact that the tenant should be paying at least the mortgage, and ideally, all expenses as well. You are treating the mortgage principal payment as an expense, and keeping the rent flat for the full 30 years. This makes no sense. Once the gain* from principal paydown is taken into account, you can easily see the returns are greatest in the first year after the cost to sell (8%) is exceeded. The behavior we were trying to understand was the result of a spreadsheet error. The word 'gain' is used here just to address the benefit to OP's bottom line, the entire exercise ignores true numbers. After 30 years of having a tenant pay his mortgage, he now owns the house outright. Of course, for tax purposes, this does not apply. Not the answer you're looking for? Browse other questions tagged investing real-estate rate-of-return or ask your own question. Discussing real estate appreciation: Compound vs. simple interest? New construction closing in a year; how can I lock in mortgage rate? What return are you getting on your money from paying down a mortgage on a rental property?